The page you are now reading describes how you can use the built-in VPN client of Mac OS X 10.3 ("Panther"), 10.4 ("Tiger") and Mac OS X 10.5 ("Leopard") with a Linux Openswan VPN server. Mac OS X 10.6 ("Snow Leopard") has not been tested by me personally but is expected to work. Panther and Tiger are no longer supported by Apple with security updates, so I would not recommend using these old versions on the Internet as VPN clients. If you are looking for information about the Mac's built-in L2TP/IPsec client, you can find some here. You can also find a few remarks about the L2TP/IPsec client included with the Apple iPhone. I will not cover the configuration of Windows 2003/2008 VPN servers or Mac OS X Servers for use with Mac based clients (contact Apple and/or Microsoft Support for that). If you are not familiar with setting up L2TP/IPsec on a Linux server, it's probably a good idea to start with reading this page. It provides information on setting up the Linux side. The other pages listed above contain specifics on several L2TP/IPsec clients which are available for Windows. In addition to L2TP/IPsec, Mac OS X 10.3 and higher also supports pure IPsec (i.e. without L2TP). But for this feature you have to edit text files manually or use one of the third party graphical user interface (GUI) clients. Pure IPsec makes configuration on the Linux server much easier. If you can use pure IPsec, you don't have to jump through all the hoops as described here on this webpage. I refer you to the Openswan Wiki for more information on pure IPsec interoperability between Openswan and Mac OS X.
Apple's L2TP/IPsec implementation supports multiple authentication mechanisms. For "Machine authentication" (the IPsec part of the L2TP/IPsec protocol) there are basically two methods: Preshared Keys (PSKs) and X.509 machine certificates. The GUI of Mac OS X 10.4 and higher supports both of these methods but Mac OS X 10.3's GUI only supports PSKs. PSKs are easier to configure than certificates but certificates provide better security and certificates are they are recommended for supporting Road Warriors. So, Mac OS X 10.3 not supporting certificates for L2TP/IPsec is a pretty severe limitation. Once the IPsec authentication succeeds, the next step is "User authentication" (the L2TP/PPP part of the protocol). Mac OS X 10.3+ supports a number of user authentication options, including MS-CHAP and RSA SecurID. This depends on the Mac OS X version that you are using. Mac OS X 10.3 supports only a small number of user authentication options and (the latest point updates for) Mac OS X 10.4 and higher support more. Mac OS X 10.4.4 and higher support NAT traversal: both the official RFC 3947 standard and Microsoft's draft-02 implementation. So Mac OS X 10.4+ should interoperate with Cisco, Openswan, Windows 2003 and other servers when NAT-T is involved. But older versions of Mac OS X (10.3.x and 10.4.0-10.4.3) do not interoperate that well with other IPsec implementations when NAT is involved. A work-around for this problem has been added to Openswan 2.4.5+. Mac OS X 10.3 and higher ship with an L2TP/IPsec client. The Mac's IPsec implementation is a fork based on KAME which is known to interoperate with Openswan. I also received a report from Chris Andrews that Mac OS X's VPN client interoperates with a setup that consists of the native IPsec implementation of the Linux kernel 2.6, plus l2tpd and ipsec-tools (racoon). The big question of course is: why would you want to use L2TP with the Mac? L2TP/IPsec has the advantage that it is an official IETF standard. Furthermore, IPsec is generally considered to be more secure than PPTP. As Apple writes, "L2TP is Mac OS X Server's preferred VPN protocol due to its superior transport encryption and its ability to be authenticated via Kerberos". These are indeed valid points: a Mac client and an Openswan server can in principle agree upon the use of strong encryption (AES, SHA-1 etc.). I have not used Kerberos on the Mac so I can't comment on that. Some users prefer Mac OS X's L2TP/IPsec client simply because it is free. Others may prefer a third-party client, because of the support that the third-party will provide. There is no installation required. The L2TP/IPsec client is installed by default on Mac OS X 10.3 and higher. The installation and configuration on the Linux side is basically the same as described on my main L2TP/IPsec page. There are however a few subtleties that need extra attention because they are different in Mac OS X 10.3 and higher, compared to other L2TP/IPsec clients. "cannot respond to IPsec SA request because no connection is known for x.x.x.x:17/1701...y.y.y.y:17/57937"
(This supersedes the EXPERIMENTAL patch that I made for other FreeS/WAN versions, where you needed to specify 17/0 instead of 17/%any). (Where 192.168.1.98 is the IP address of the internal interface). This is similar to what you can find on my main L2TP/IPsec page. The difference is the removal of --sport 1701, so that all source ports are forwarded, not just port 1701. Unfortunately this trick does not work with the kernel 2.6 IPsec implementation ("NETKEY") because NETKEY does not have ipsec0 style interfaces and NAT-after-IPsec is currently broken on vanilla kernel 2.6. There might be a few ways to solve this problem on 2.6 kernels. The first two mentioned on that link should work, although I have not tested these myself yet. I noticed that Mac OS X's L2TP client does not supply a hostname during the L2TP connection negotiation (our_params.host_name = 0?). This is not a problem, as long as you use at least version 8jdl of my l2tpd RPM (which contains this hostname patch). The MSL2TP client has the same issue. If you happen to use l2tpns as your L2TP daemon, you may need to apply a patch to the source code because l2tpns' HELLO messages apparently confuse Mac OS X. More information can be found on this webpage by Wolfgang Hennerbichler. You may notice the parameter forceencaps=yes. This was added because of a bug in Openswan (incorrect routing) which rears its head when you use right=%any in combination with rightprotoport=17/%any. Unfortunately this is a very common configuration when you want to support Mac clients. There are four workarounds but each one has its drawbacks: A) use right=client.ip.add.ress instead of %any: this only supports 1 client with a fixed IP address, not a very attractive prospect. B) use 17/1701 instead of 17/%any: Mac clients can no longer connect. C) remove the parameter rightsubnet=vhost:%priv,%no : NAT is no longer supported D) add the parameter forceencaps=yes: this forces NAT traversal, so it introduces unnecessary overhead if clients are not behind NAT. Another drawback of option D is that Windows XP/Vista/7 clients will then need a registry modification because the server appears to be behind NAT. Nevertheless, option D is probably the easiest solution, if you happen to have Mac clients. At "Server Address", enter the hostname or IP address of the VPN server. At "Accountname", enter the username that will be use in the PPP authentication phase. Mac OS X lists a number of user authentication options under "User Authentication". I would recommend that you first try CHAP, because it is easier to use. So enter your CHAP password in the "Password:" field and also configure your Linux server for CHAP. At "Machine Authentication", enter your "Shared secret". This is the IPsec PSK that you entered in ipsec.secrets on your Openswan server. If you click on the button "Advanced..." you can find the option "Enable VPN on demand". Presumably it does exactly what it says: the VPN connection is automatically initiated when a particular hostname (or subnet?) is accessed by whatever program. I have not looked into this, as I am not a big fan of things that happen behind my back :-). Support for Dead Peer Detection is only supported on Mac OS X 10.5 and higher. It is not supported on Mac OS X 10.3 and 10.4. Mac OS X supports a number of PPP user authentication options, depending on the version of Mac OS X that you use. If you want to use a particular PPP authentication option then you also need support for that option on the Linux server. All Mac OS X versions support CHAP and RSA SecurID. As mentioned above I recommend that you first try to get CHAP passwords working. They are easier to use and things are easier to troubleshoot. If you want to use RSA SecurID hardware tokens (EAP type "fe" or 254, according to pppd): I understand that there is a Linux version of the RSA SecurID server but this is outside the scope of this webpage. Starting from 10.4.4(?) Mac OS X also supports PAP and MS-CHAP(v2) password authentication. You don't actually have to tell the Mac what type of password authentication to use, it automatically uses the type of authentication requested by the PPP server. Starting from 10.4.3(?) Mac OS X also supports user certificates for PPP authentication (EAP-TLS). This is the option "Certificate (Select)" under "User Authentication". Don't confuse this with certificates based IPsec authentication which is the option "Certificate (Select)" under "Machine Authentication". It appears that you can select the same certificate for both User and Machine Authentication, unlike Windows 2000/XP. I have not looked at EAP-TLS authentication yet but you can find some pointers here. Starting from 10.4.3(?) Mac OS X also supports Kerberos for PPP authentication (EAP type "Windows 2000", according to pppd). I haven't looked at this. It is outside the scope of this webpage. Starting from 10.4.6 Mac OS X also supports CRYPTOCard hardware tokens. I understand that there is a Linux version of the CRYPTOCard server but again, this is outside the scope of this webpage. Some users have reported the following error: "MPPE required but peer negotiation failed" (read this thread). This is odd because MPPE is not required for L2TP/IPsec, only for PPTP. 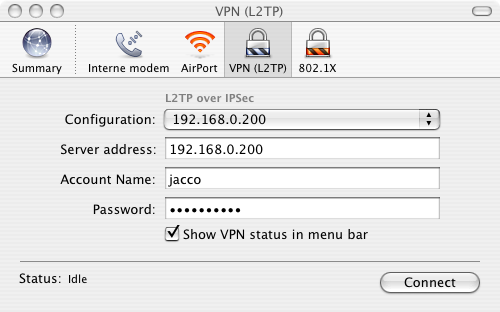 If you see a padlock with the text "VPN (L2TP)", continue with the next step. If you do not see such a padlock, you have to add it: open the menu, choose "File" and then "New VPN Connection". You will be asked to choose between "L2TP over IPsec" and "PPTP". Select "L2TP over IPsec". Click on the padlock with the text "VPN (L2TP)". In the "Configuration" pull-down menu, select "Edit configurations...". Enter the "User Authentication" details for your VPN connection (Mac OS X 10.3, Mac OS X 10.4): the hostname or IP address of your Linux VPN server and the "Account Name". Mac OS X lists a number of user authentication options. I would recommend that you first try CHAP, because it is easier to use. So enter your CHAP password in the "Password:" field and also configure your Linux server for CHAP. Enter your "Shared secret". This is the IPsec PSK that you entered in ipsec.secrets on your Openswan server. If everything is OK then "Status" should say: "Connected To", followed by the IP address of the PPP server running on the internal interface. There is also a field "Group Name (optional)" in Mac OS X 10.4.6+. This option appears to used for connecting to Cisco VPN servers (XAUTH and/or Hybrid Mode?) with a PSK. When used with a certificate the option probably does not have any effect. I did not look into this because Cisco modes are unsafe anyway. The client also has an option "Enable VPN on demand". 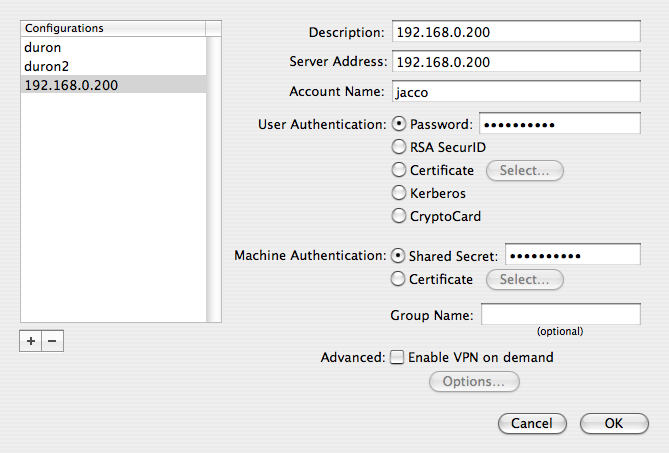 The VPN client GUI in Mac OS X 10.4 and higher supports both certificates and PSKs for IPsec authentication. Mac OS X 10.3's GUI only supported PSKs. There are two steps involved: first you import your PKCS#12 user certificate and then you add a VPN configuration that uses this certificate. Login password: this is the password that you use to login on the Mac. Importing machine certificates for L2TP/IPsec authentication requires an account with Administrator privileges. Certificate password: this is the password that protects the PKCS#12 file containing the machine certificate. You need the password to access the encrypted parts in the file. CHAP password: this is the "User Authentication Password" that you enter in the "Internet Connect" application. It is used in the L2TP/PPP phase of the L2TP/IPsec protocol. Preshared Key: this is something which can be regarded as a password (see the previous section). Note that PSKs are not involved when you use certificates for authentication. I'm just mentioning PSKs here for the sake of completeness. The server certificate MUST contain an "subjectAltName" ID which matches the hostname ("USER_FQDN") or IP address ("IPV4_ADDR") of the server. The server certificate MUST either not contain an "Extended Key Usage" (EKU) or MUST include "ikeIntermediate" (1.3.6.1.5.5.8.2.2) as an Extended Key Usage. The subjectAltName identifier (ID) must match what was entered in the "Server Address" field in the Mac's "Internet Connect" (see below). Examples of a hostname and an IP address are vpnserver.example.com and 123.123.123.123, respectively. Obviously, using a numeric IP address as the ID is not very flexible so in most cases you would want to use a hostname in the server certificate. Note that Mac OS X 10.4+ clients will not allow you to connect to servers that present a server certificate containing a Distinguished Name ("DER_ASN1_DN") as its ID, such as "C=CH, O=ACME, OU=Research, OU=Special Effects, CN=Bart Simpson". But Mac OS X clients are not fussy about client certificates: they are allowed to contain any type of ID. There are no restrictions for client certificates, unlike server certificates. One of these two lines have to be added. Without a subjectAltName in the server certificate Openswan will report the error: "ignoring informational payload, type INVALID_CERTIFICATE". If there is an EKU in the server certificate without the EKU "ikeIntermediate", then Openswan will report the error "ignoring informational payload, type INVALID_CERT_AUTHORITY". More information about using certificates with IPsec can be found in the Strongsec documentation. Obviously, an IP address is less flexible. Click the orange padlock at the top left hand corner. Enter your password (importing a machine certificate requires Administrator privileges). You hear a metalic noise and the padlock is unlocked. If you don't see a "Keychains" pane in the left hand side of the window, click the symbol in the bottom left corner of the window. The "Keychains" pane should now appear and the triangle should now point upwards. Click on the "System" keychain. It will be highlighted. From the menu, select "File -> Import Items... " (or press Option-Shift-I). Typically, three items will be added to the System keychain at this stage: a private key (grey key symbol), a root certificate (orange symbol with a blue plus sign) and a machine certificate (blue symbol). You should not see any red crosses through any of these newly imported items. If this is not the case, check the properties of these items for reasons why they are untrusted. Exit the Key Access application. If you did not see any items in the "System" keychain, then click "All Items" in "Category". It works as a filter so perhaps the certificate was actually imported but simply not shown because of the filter. If you get this error: "An error has occurred. Unable to import an item. CSP_INVALID_DATA" then you typed an incorrect PKCS#12 password. Unfortunately there is no indication about which private key belongs to which certificate. So should you want to delete a certificate be very careful about which corresponding private key you delete. The procedure for adding an L2TP VPN configuration with authentication based on certificates is very similar to the procedure described above for PSKs. Except you can now select a certificate instead of a PSK. Important: in the "Server Address:" field you have to enter the hostname or IP address that is contained as an ID in the server's certificate (as mentioned above). Certificate authentication cannot be used because your keychain does not contain any suitable certificates. Use Keychain Access to import the appropriate certificates into your keychain. If you do not have the certificates required for authentication, contact your network administrator. The first time you click "Connect" you may get an IPsec connection but the L2TP connection may not work properly. If you disconnect and reconnect it should work. You may also have to reboot (or sudo /usr/bin/killall -9 racoon) before the machine certificate is correctly installed into the racoon of Mac OS X 10.4 and higher. As with Mac OS X 10.5+, there are two steps involved: first you import your PKCS#12 user certificate and then you add a VPN configuration that uses this certificate. I am not aware of documentation by Apple or a webpage which provides any information on how to import a client certificate on Mac OS X 10.4 for L2TP/IPsec authentication. So I had to come up with something myself. The following procedure worked for me but may be too complex for some (end-)users. I hope that some time Apple decides to fix it so that you don't have to jump through hoops like described below. Type the following command (all on one line) and press Enter: sudo "/Applications/Utilities/Keychain Access.app/Contents/MacOS/Keychain Access"
If the bottom left button says "Hide keychains", skip to the next step. If the button says "Show keychains", click that button. You should now see a number of keychains at the left-hand top: "login", "X509-roots", "X509-certificates" and "System". From the menu, select File -> Import (or press Option-Shift-I). Enter the Keychain Access password. Typically, three items will be added to the System keychain at this stage: a private key (grey key symbol), a root certificate (orange symbol) and a machine certificate (blue symbol). If you examine the details ('summary') of the machine certificate or the root certificate, you will notice that they are reported as 'untrusted'. Drag the root certificate from the "System" keychain to the "X509Anchors" keychain. This is unlike the procedure for Mac OS X 10.5+. This step will change the status of the certificates from untrusted to trusted. (Unfortunately the status is not immediately updated but if you quit the Keychain Access application and start it again, you will notice that indeed they are now trusted). If you get this error: "An error has occurred. Unable to import an item. CL_INVALID_FIELD_POINTER" then you have started the Keychain Access application as a normal user. That will work fine for importing user certificates (in the "login" keychain) but not for machine certificates. You have to open a Terminal and enter the "sudo" command as mentioned above. (There is an option "Click to unlock the System keychain." but if you do that and import a certificate, you still get the error. You really have to use the sudo. I don't know if this is a bug in Mac OS X or if it is really as intended by Apple). If you get this error when you drag the root certificate to X509Anchors: "An error has occurred. Unable to add an item to the current keychain. The specified item already exists in the keychain. ", then apparently the root certificate already is available in X509Anchors. You can safely remove the root certificate from System by selecting it and selecting "Edit -> Delete" in the menu. If you are a die-hard command line fan you can use the utility 'certtool' that is included with Mac OS X. It works for me but I did not look into this much because the command line scares off most users. Anyway, here are the commands for importing a file in PKCS#12 format. This example assumes that the file is called 'yourcrt.p12'. The procedure works on Mac OS X 10.4 but I am not sure if it also works on Mac OS X 10.5+. It is probably better to use the GUI which does work, unlike the GUI in 10.4. (With special thanks to the author of this Mac OS X hint). "OS X creates config-files on the fly, but the main racoon.conf is not touched, instead there's a parameter in racoon.conf that says: include "/etc/racoon/remote/*.conf" So I changed the racoon.conf just to my needs (Certificates and so on), and removed this include-line. With that, you can set the connection up via the GUI, and racoon will be called by the GUI with the correct parameters and the policies will be set correctly. This might be a problem if you have more than 1 network (different certificates) to connect to". The relevant configuration file can be found on this page. "Agent Smith" provided a similar setup on the Openswan mailinglist. For information about IPsec NAT-Traversal in general, see my other webpage. Apple supports the IETF NAT-T standard (RFC 3947) in Mac OS X 10.4.4 and higher. These versions should interoperate fine with recent versions of Openswan and Cisco that also support RFC 3947. Windows clients and Windows Server 2003 should also interoperate because Mac OS X 10.4.4+ supports the draft NAT-T version implemented by Windows ("draft-ietf-ipsec-nat-t-ike-02"). For Mac OS X 10.3.6+ and Mac OS X 10.4.0-10.4.3 the situation is different. Apple implemented its own NAT-T variant which is is incompatible with most other IPsec implementations. Mac OS X sends the non-standard vendor ID string "draft-ietf-ipsec-nat-t-ike" instead of "RFC 3947". According to some reports Apple's version is a draft version 8 of the NAT-T standard which was the latest draft before the standard was ratified. This draft version is not the final version and, in fact, draft 8 jumped the gun a bit because it uses invalid ISAKMP payload types which were already allocated to RFC 3547 by IANA. Apple's NAT-T version does not interoperate with other IPsec implementations unless they specifically support this Mac OS X quirk. Apple's Mac OS X Server is one of these implementations; the Stinghorn L2TP/IPsec Gateway is another one. Recent versions of Openswan also support Apple's NAT-T version (see the next section). Apple's racoon modifications are available on their website (e.g. here for Mac OS X 10.4.9) but they are available under the Apple Public Source License which unfortunately means that you cannot use these modifications directly in Openswan (=GPL) or KAME (=BSD). Apple does not want to relicense the code either because of legal concerns. Peter Van der Beken has created a patch for Openswan that supports Apple's oddball NAT-T version. This patch has been adapted by Michael Richardson of the Openswan team and incorporated in Openswan 2.4.5+. Paul Wouters of the Openswan team noted that a rekeying problem occurred after one hour. Note that even with Openswan 2.4.5+ you will still not be able to use NAT-T with a PSK if your Openswan server is using KLIPS. This is because the NAT-T patch for KLIPS does not support PSKs. You have to switch to NETKEY because NETKEY does support NAT-T with PSK authentication. Also note that NETKEY has problems supporting the Mac's floating UDP source port. I have also not tried to connect with multiple Macs behind the same NAT device so I don't know if that is supported. Apple's racoon version is a fork of KAME's racoon which has been discontinued. Unfortunately Apple has decided to start their own racoon fork instead of using the ipsec-tools fork of racoon which is still in active development. Other BSD versions such as NetBSD did switch to ipsec-tools. This means that Apple is missing out on features such as IPCOMP unless they add them theirselves. The iPhone is based on Mac OS X. It ships with a built-in client that supports a number of VPN protocols including L2TP/IPsec. I have no first hand experience with the iPhone. Kim Hendrikse reports that the iPhone connects to an Openswan based L2TP/IPsec server but for some reason the iPhone disconnects within a minute if there is no payload traffic, no matter if you use PPP/L2TP/IPsec's keep alive mechanisms. According to an Astaro press release, their Astaro Security Gateway appliance is compatible with the iPhone for both L2TP/IPsec and PPTP. The Astaro Security Gateway is based on Linux (Strongswan, l2tpd etc.) so I suppose it also works with the setup described on this webpage. PPTP with MS-CHAPv2 based user authentication. L2TP/IPsec with Preshared Key (PSK) based IPsec authentication and MS-CHAPv2 based user authentication. L2TP/IPsec with CryptoCard authentication, but only if the "shared secret" method is used. Pure IPsec (i.e. without L2TP). EAP-TLS (i.e. PPP user certificates or smartcards). Currently the iPhone can store only one PPTP and one L2TP/IPsec configuration. This too shows that there is room for improvement. Select "General" -> "Network" -> "VPN" and then tap "Settings". Enter the L2TP/IPsec server's address. Tap "Account" and enter your username (for user authentication in the PPP phase of the VPN). If you want to store your password on the device, tap "Password" and enter your password. Tap "Secret" and enter your Preshared Key (for IPsec authentication). This is similar to the "Shared Secret" for Machine Authentication if you are familiar with Mac OS X. Once you have configured a VPN connection, a VPN on/off slider appears at the top of the Settings list. Tap this to turn the VPN on or off. The iPhone appears to have an interactivity timeout problem, unlike Mac OS X. The connection is terminated by the iPhone after about one minute if there was no 'useful' network data sent over the VPN connection. It also does not send a "Delete SA" message to the server. DPD does not help. It does not matter if the user keeps the iPhone active by tapping the screen, for example. There must be data sent through the VPN tunnel to keep the iPhone from disconnecting, such as browsing websites. Very annoying. Keep-alive packets (IPsec, L2TP and PPP) seem to be ignored. One final note: PublicVPN.com reports a couple of problems in the iPhone firmware. Version 1.0 has a bug where you have to type the password in every time you connect. Version 1.01 has a different problem: DNS resolution doesn't work if you're connected to a VPN. Without DNS support the VPN connection may not be very useful. Mac OS X does not propose Perfect Forward Secrecy (PFS) by default. I don't know how to do enable PFS through the Mac OS X GUI (e.g. the "Internet Connect" program). There is no mention of a "PFS" setting. I suppose the default racoon.conf can be modified so that PFS is enabled (similar to the procedure described above) but I haven't tried that. There are valid reasons for using PFS. If you really need PFS and you don't want to modify the default racoon.conf, you could decide to switch to IPsec without L2TP (e.g. through a third-party IPsec client or configuration utility). Then it is possible to enable PFS. According to Wolfgang Hennerbichler, Mac OS X also supports DHCP in order to retrieve settings such as DNS servers, domain names, static routes etc. from the VPN server. This is completely optional, the VPN connection should work without them. You need a DHCP server that supports DHCP INFORMATIONAL Messages, such as ISC DHCPD 3.x or higher. By default, Mac OS X proposes ISAKMP SAs with 3DES encryption, HMAC authentication based on SHA-1 hashes and DH group 2 (MODP1024). These are reasonable defaults and Openswan will accept them. The Mac OS X configuration file racoon.conf contains a line that should enable the 'deflate' type of IPsec compression (IPCOMP) for its IPsec SAs. But it seems that the Mac OS X kernel does not support it. I don't see an IPCOMP header in the packets that the Mac sends. Openswan supports IPCOMP deflate but by default it does not enable it. You can enable deflate compression by compress=yes to the connection section(s) in your ipsec.conf. But this will not result in actual use of IPCOMP because the Mac OS X kernel does not seem to support it. There are two phases: the IPsec phase and the L2TP/PPP phase. 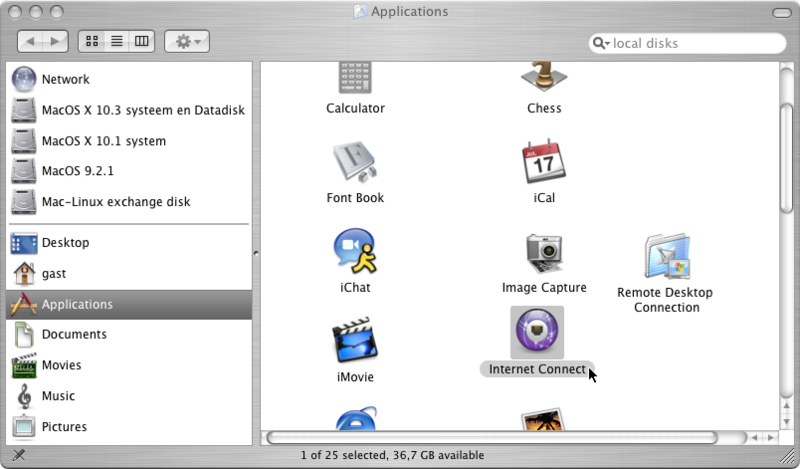 Logging information can be found in several locations on Mac OS X. The logfile of Racoon (the Mac's VPN daemon) can be found at /var/log/system.log (Examining this file requires superuser privileges so use something like "sudo less /var/log/system.log"). On Mac OS X 10.5 and higher, the "Network" option in "System Preferences" has a button called "Advanced". 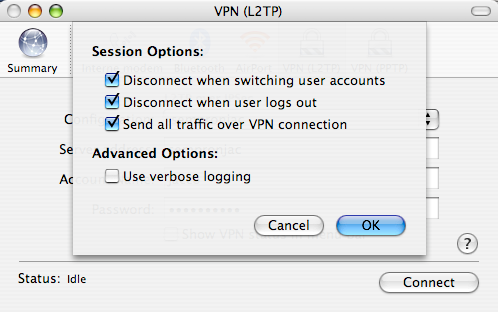 If you click this button, you find an option "Use verbose logging" which is supposed to capture more detailed log information in your VPN session. Problem is, Apple does not say where these details are logged. On Mac OS X 10.3 and 10.4, the most basic logging information can be found in the "Internet Connect" application by opening the "Connection Log". You can find it in the menu under "Windows". Run "sudo vi /etc/racoon/racoon.conf" on the Mac OS X command line. Connect to the Linux VPN server (this will start racoon again). This will create a file called ktrace.out in your current working directory. Connect to the Linux VPN server. Wait a while for things to get written to the log. Nov 15 12:02:17 localhost racoon: ERROR: oakley.c:2071:oakley_skeyid(): couldn't find the pskey for 192.168.0.111. I had to go to "Edit configurations..." window and change the IP address there. You cannot change the IP address in Internet Connect's main window and expect it to work. From the menu, select "Connect" and then "Options". Uncheck "Send all traffic over VPN connection". IPsecuritas from Lobotomo Software adds a graphical front-end to the built-in IPSec core, "allowing you to setup secure communications within minutes". It is freeware and known to interoperate with Openswan, KAME (racoon) and NETKEY. It contains a Certificate Manager. A howto with screenshots for connecting with IPsecuritas to an Openswan server is available. VaporSec: Mac OS X 10.2+ contains IPsec support through KAME. It does not support L2TP/IPsec. VaporSec is a free user interface for KAME which is normally configured through ASCII configuration files. VaporSec creates IPSec policies that will allow you to connect to other IPSec devices. This may be another Mac OS X 10.2+ machine or a third-party firewall, VPN or other IPSec device. I think it has been tested with FreeS/WAN. I see no mention of compatibility with Mac OS X 10.3, but according to Patrik Tschudin, it does work. "Mac OS X only supports a special protocol and not the standard IPsec". This is not quite true. Mac OS X's GUI only supports L2TP/IPsec, which is not a "special protocol" but an official IETF standard (RFC 3193). It is simply L2TP tunnelled within IPsec. And if you are comfortable with Mac OS X commandline, you are probably capable of using standard IPsec. It's just that VPN Tracker automates that for you with a very nice GUI. "Therefore it's not compatible with most third party devices out there". That's because not all third party devices currently support L2TP-over-IPsec, but the number is increasing. L2TP is used by Microsoft, Cisco, Checkpoint and other vendors to allow remote users to obtain an IP address from the internal network. Pure IPsec cannot do that. I'm not saying that L2TP is the best solution (IKEv2 seems much more interesting) but it is a ratified standard and it is already supported by many clients and servers. "VPN Tracker on the other hand comes with predefined connection types for the majority of VPN manufacturers and extensive interoperability how-to documents are available for most set-ups". In a perfect world you would not have to have different connection types for different vendors because all vendors would adhere to the same standard and implement it without interoperability issues. In practice, things are different. I have not used all third party devices supported by VPN Tracker but the ones I did test are generally compliant with the standards. Nevertheless, I think it is a big plus that VPN Tracker has identified remaining issues and provides ready-to-use configurations. "A complete certificate management solution with built into CA features and an import/export that enables an easy rollout for enterprise scenarios". I think this feature is only in the Professional version of VPN Tracker. You won't need CA functionality if you only want a VPN client and you have made your own provisions to generate your certificates. I must admit that from the screenshots it looks very nice. Mac OS X supports PPTP. This VPN protocol has its advantages and disadvantages, compared to L2TP/IPsec. In a nutshell, PPTP is not an official standard, considered to be less secure than IPsec, but also easier to use. 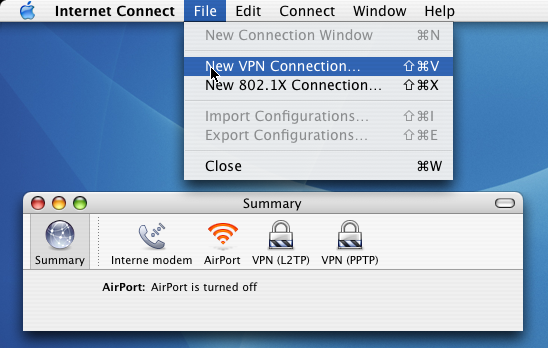 Apani Mac OS X VPN Client: Known to work with Nortel Networks VPN Router (formerly Contivity) and Cisco VPN 3000. Status unknown with Openswan. Pricing and licensing terms are not known to me but I suspect there is no benefit in using this client for Openswan. Cisco VPN client for Mac: uses IPsec with XAUTH (extended authentication) which is supported by only a few other vendors. XAUTH support is currently in development on Openswan but I do not know if this client will work with Openswan. I also don't know the pricing and licensing terms but I suspect it may not make (financial) sense to use the Cisco client with Openswan. You need a valid CCO userid to download the Cisco VPN client from the Cisco website. Make sure you use recent versions of Mac OS X and the Cisco VPN. Checkpoint Secureclient: Status unknown with Openswan. Pricing and licensing terms are not known to me but I suspect there is no benefit in using this client for Openswan. DigiTunnel from Gracion: this is a PPTP client which has some extra features over the built-in Mac OS X PPTP client, such as split-routing (many companies consider this a security risk, though). OpenVPN. This is an Open Source project with clients for Windows, Linux, Mac OS X, Darwin, Solaris etc. This page is sponsored by the HCC Amsterdam user group. Alan Whinery demonstrated that certificates are now much easier to import on Leopard. Thanks to Manny Veloso of PublicVPN.com for allowing me to test interoperability between Mac OS X Server and Linux L2TP/IPsec clients. Thanks to Alexandre Ghisoli for bringing the INVALID_CERT_AUTHORITY problem to my attention, and to Daniel Bertolo for solving the problem. May, 24 2010: Started section about (Snow) Leopard. Mar 5, 2008: Started section about DHCP Inform. Feb 26, 2008: Added section about split tunnellng. Jan 8, 2008: iPhone compatible with the Astaro Security Gateway appliance. Jan 4, 2008: There is a bug in Openswan which pops up when you want to support Mac clients (workarounds mentioned). Oct 30, 2007: First tests with Mac OS X 10.5 (Leopard) are inconclusive: some users report success, others had problems. Oct 25, 2007: Added more info about requirements for server certificates. Sep 19, 2007: Added some remarks about the iPhone. May 22, 2006: Mac OS X 10.4 supports PAP/CHAP (10.4.4+?). Also new: CryptoCard (10.4.6+) and EAP-TLS (10.4.4+?). Feb 12, 2006: Mac OS X 10.4.4+ supports the IETF NAT-T standard (RFC 3947). Dec 6, 2005: That patch is no good. Get Openswan 2.4.5 or higher. Nov 21, 2005: Made patch (based on Peter's patch) that swaps the NAT-D hashes: needed for NAT-T.
Nov 12, 2005: Added command line procedure for importing machine certificates on Mac OS X 10.4. Update on DPD, IPCOMP. Nov 7, 2005: Added procedure for importing machine certificates on Mac OS X 10.4. Sep 29, 2005: (Updated) patch by Peter Van Der Beken available for NATed Mac clients. Jun 26, 2005: Reportedly, the VPN problems in Tiger have been fixed in update 10.4.1. May 3, 2005: Mac OS X 10.4 breaks several third-party VPN clients. Whoops. L2TP/IPsec (and PPTP) should work. Apr 27, 2005: First report of Mac OS X 10.4: has a GUI for certs. NAT-T still non-standard. Jan 16, 2005: Added mention of a method to use certificates on Mac OS X 10.3. Jan 8, 2005: Mac OS X's NAT-T support is bogus. Apple implemented the RFC but mislabeled it. Nov 23, 2003: Confirmed by Apple employee: no cert support yet. Nov 16, 2003: Added screenshots and more details. Nov 15, 2003: Succesfully tested with PSKs (had to make a FreeS/WAN patch though). Nov 6, 2003: Page created.